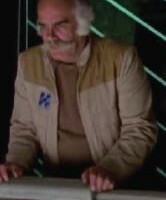 The Rebel Officer wears the brown shirt and pale jacket of a Starfighter Command officer. Unlike the Generals, his jacket lacks rank insignia or brown shoulder epaulettes. 1. Accurate khaki/tan jacket with brown shoulders (yoke) and four pockets in front. 2. Medium brown or dark tan shirt with bib in front, no visible buttons. 3. Khaki/tan pants with solid dark brown or black stripe on side of each leg or olive green pants. 4. Brown belt 1 ¾ to 2 inches wide with oval buckle. 5. Brown, flat soled, tall boots (14-16 inch tall shaft), riding boots recommended, or black boots/shoes with olive drab gaiters or puttees. Heels must be no higher than 1 inch. No obviously visible zippers, buckles, or laces. 6. Rank badge: 5 blue pips or 4 red with 1 centrally located blue pip. Natural/cream colored duster with lapels, mid-calf to ankle length, no buttons.